ROXBURY – With four acres of his blooming flowers in a blur of purple, white, red and yellow, Ed deFiore sees mostly green. His cut-flower business will bring in $65,000 this summer, and perhaps as much as $110,000 next year, when many of his peony plants mature, he said. He and other Vermont flower growers are gaining markets in large cities such as Montreal, New York and Boston and expanding to several cities in far away states, including Florida and California. “It’s a viable enterprise in Vermont, one of the most lucrative agricultural crops around,” said Elizabeth Bier [Krieg] president of the Vermont Cut Flower Council, formed this summer. Vermont’s later and cooler growing season is beneficial because it allows farmers to sell the flowers – or “stems” as they are called in the business – a few weeks later than the more southern states. ​Bier [Krieg] of Rising Sun Floral in Randolph began her agricultural career several years ago by growing organic vegetables, but she finds that flowers bring her five times as much money per square foot. Flowers are high quality for commercial dealers when they have long stems, an extended vase life and no insects, she said. They also must be cut at the peak of their bloom. The secret of the cut-flower business is finding a niche, said diFiore, 54, a former Harvard College professor. He specializes in perennials and some bulbs: tulips, peonies, lilacs, delphinium, lilies and several “experimentals,” such as monkshood. He has been growing flowers for sale about five years. Although Bier [Krieg] sells mainly to restaurants and wholesale markets in Boston, deFiore has extended to markets beyond the New England area. He uses a refrigerated truck or insulated boxes to ship by air freight. He shares a truck with another grower, and points to the state’s council as a way other flower farmers can learn about each other and share equipment. The Agriculture Department started the panel in July to help the flower famers. “The council will give the industry a chance to grow, to share experiences and resources,” Tom Bisson of the department said. “It will also help to avoid accidental competition. Say, I knew you were growing roses, maybe I would grow something else, or concentrate on a different market. Bisson said the council will help the state keep track of the industry. 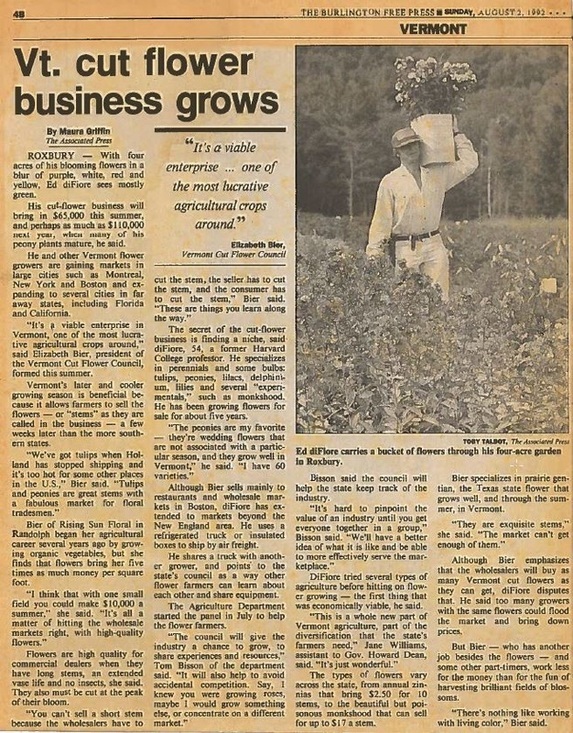 Di Fiore tried several types of agriculture before hitting on flower growing – the first thing that was economically viable, he said. Bier [Krieg] specializes in prairie gentian, the Texas state flower that grows well, and through the summer, in Vermont. Although Bier [Krieg] emphasizes that the wholesalers will buy as many Vermont cut flowers as they can get, deFiore disputes that. He said too many growers with the same flowers could flood the market and bring down prices. But Bier [Krieg] – who has another job besides the flowers – and some other part-timers, work less for the money than for the fun of harvesting brilliant fields of blossoms. “There’s nothing like working with living color,” Bier [Krieg] said. ​WE ARE NOT OPEN TO THE GENERAL PUBLIC SO PLEASE CONTACT US TO SCHEDULE A VISIT.